Sears has an exclusive promo code today during this 8 Hour Flash Sale! Save $50 off your purchase of $200 or more. Enter the promo code 941612633 at checkout to get the discount. 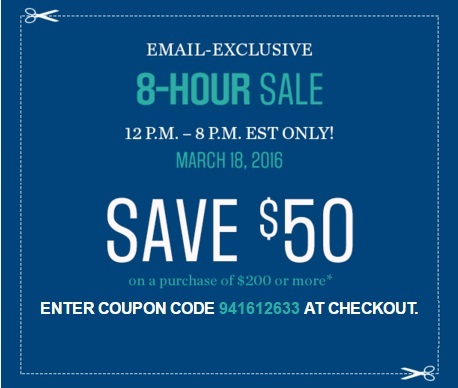 Offer is valid today only, Friday March 18 until 8pm ET. Excludes items with prices ending in .94, .91, .88 and .97, Regular- and Clearance-priced items, Today Only items, and Canada's Best items. Also excludes Major Appliances (except vacuums, sewing, & heating/cooling products), Beauty & Fragrances, Patio & BBQ, Dyson, Samsonite Core luggage, Nespresso, Keurig, Magic Bullet, SodaStream, Heritage "The Rock" Skillets, Cast Iron Skillets, Garage Door Openers, Gladiator, Panasonic, Gift Card purchases, deferral or installment billing fees, protection agreements, delivery, installation and maintenance charges.